As many of you know, my idea of cooking is generally to “peel back and vent.” But when it comes to hot fudge, I become industrious. Why? I wouldn’t think of defiling a potential sundae by using fake hot fudge sauce containing corn syrup. Here is the recipe I use most often for hot fudge sauce. There’s a step missing though, which is: taste liberally and maybe even add some ice cream! 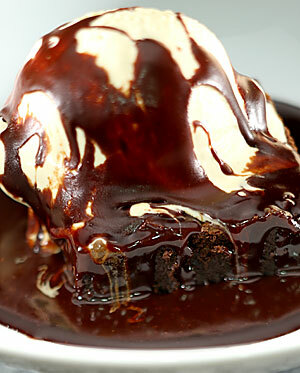 (I prefer vanilla or coffee ice cream with this hot fudge.) And if you have a brownie or a chocolate chip cookie lying around…. Gradually mix in the sugar and milk. Increase heat to a boil. Cook, stirring constantly, for 8 minutes. Remove from heat, and then stir in vanilla and salt. Serve warm. This entry was posted in food, Holiday and tagged food, Holiday. Bookmark the permalink. Wow, your pic is gorgeous!!! Any time you want to have a taste fest, let me know. I’ll bring mine and you make yours. YUM!! Wouldn’t that be fun? Definitely a hot fudge cook off would be great! Actually, tonight, I’m going to add some chipotle to give it a Tucson kick and see how that goes. Mmmm. I was wondering if that was your picture because maybe you have a future in food photography! I will be craving this all day long….. This sounds like a perfect recipe to go with the ice cream recipes we have been trying in our new ice cream maker. I’ll have to pass these two recipes on to my hubby – I’m not much of an ice cream or hot fudge sauce person, but he is. Ummmm HOW did I not know about this holiday until now?! I suppose National means USA? That could be it. Either way, I am definitely going to celebrate from Canada 😀 And I can’t wait to try out the recipe. Heh, true. I will accept that as I think Canada needs this holiday as well. Oh ya know, that is just too much of a tease. Yummy!!!!!! I have the ingredients, but not the ice cream. How sad. Yummy! This looks great. The picture, is that ice cream AND brownie that I see there? Hmm…..
It’s a good thing my scale was a little less scary this morning (hopefully end of plateau) so I’m not as tempted as I would normally be to say, “Heck with it! I’m going to have a hot fudge sundae.” As it is – no thanks! Looks wonderful though. Sounds pretty easy – my requirement. I showed the picture to my husband and told him about the holiday. He felt it was our patriotic duty to eat that today. So we will. This is one holiday that I will definitely celebrate!! How come I didn’t get the memo on Hot Fudge Sundae day? I seem to have mistakenly celebrated granola day instead. Oh Man … you are just KILLING me with these posts!!! This is one cooking post that I will use! Totally drooling over here! I agree that chocolate sauce of any sort with HF-Corn syrup is sacrilegious. I love coffee ice cream too! And brownies, and cookies. . . 🙂 So many wonderful things to add fudge sauce too! I’m going to try this recipe. Thanks for sharing. I can totally get behind a National Hot Fudge Sunday day! Your recipe sounds fabulous! Thanks for sharing it! Oh sweet Mary that just made me so amazingly hungry for hot fudge. Yum-my. Oh my, how did I miss this holiday?? But I do not think it is too late to celebrate, not at all. Oh Jill–I’ve been meaning to comment on this post for quite some time. Time gets away from me these days. Anyway, it looks absolutely divine. Anything with confectioners’ sugar is great in my book! I flipped back a page to my July calendar … it’s clearly a defective one, as Natl Hot Fudge Sundae Day (Dae?) is not listed! I’ll be sure to check the July listings before I commit to a calendar for 2011.